Black Balloon Publishing, 9781936787074, 280pp. 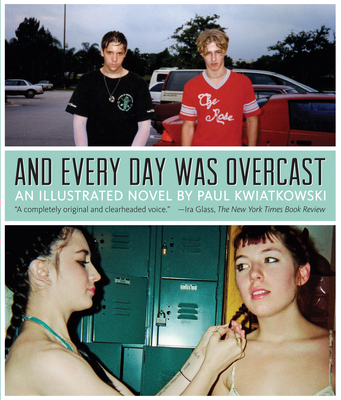 "A tale of trailer parks, drugs and teenage construction and destruction, Paul K has brought forth an American diary hugely personal and partially universal. Through skillfully written prose and raw imagery that's authored, found and stolen, we witness the protagonist's young life on display. It's not pretty nor should it be. A scrapbook of intention and carefully put together pieces, we witness elation and pain and the special concoction of America's 'Florida' in all its glory." Out of South Florida's lush and decaying suburban landscape bloom the delinquent magic and chaotic adolescence of And Every Day Was Overcast. Paul Kwiatkowski's arresting photographs amplify a novel of profound vision and vulnerability. Drugs, teenage cruelty, wonder, and the screen-flickering worlds of Predator and Married...With Children shape and warp the narrator's developing sense of self as he navigates adventures and misadventures, from an ill-fated LSD trip on an island of castaway rabbits to the devastating specter of HIV and AIDS. This alchemy of photography and fiction gracefully illuminates the travesties and triumphs of the narrator's quest to forge emotional connections and fulfill his brutal longings for love. Paul Kwiatkowski is a New York-based writer and photographer. This is his first novel. His work has appeared in numerous outlets, including Juxtapoz, Beautiful Decay, Dazed and Confused, Fault, Dust, and American Suburb X.